Home / Slots / Try Mega Moolah for a difference! 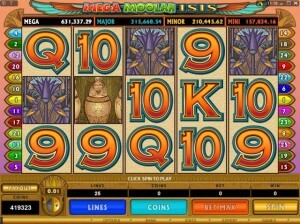 There is another Mega Moolah video slot and it is known as Mega Moolah- Isis. This unique theme is centered on Isis who is the goddess of Motherhood and Fertility. The goddess is the Wild symbol in the game, and all pays with the Isis Wild symbol are doubled. The Scatter pay Free Spin round is very big in this game. First of all, you will receive 20 Free Spins for 3 Scatter symbols, 25 Free Spins for 4 Scatter symbols, and 30 Free Spins for 5 Scatter symbols. Even better is the fact that every win will be multiplied by 6! The free spins can also be re-triggered during the round, which means you can receive more Free Spins. The Jackpot for the Free Spin bonus is an incredible 1,200,000 coins! 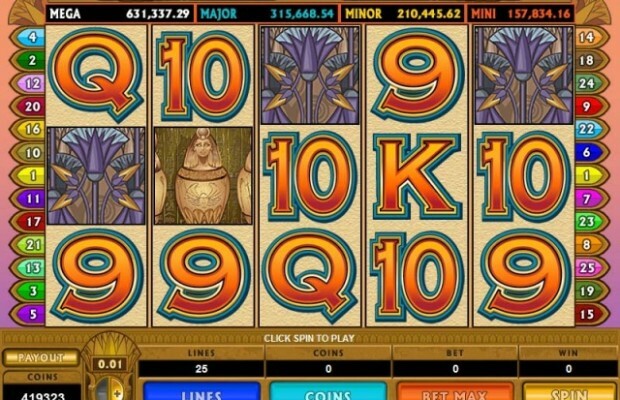 Besides the Wilds, Multipliers and Free Spins, there are several other great features. Whenever you get a win in the base game you have the ability to Gamble those winnings. What this means is you can go to a bonus screen and double or quadruple the amount you won. If you choose the correct color of the card (red/black) your winnings will be doubled, and if you choose the correct suit (Spades, Diamonds, Hearts, Clubs) your winnings will be multiplied by four. The last big feature of the Mega Moolah-Isis game is the 4 Progressive Jackpots that are offered. The Progressive Jackpot winners are randomly selected, and the more coins you are betting the greater your chance is to hit the Progressive Bonus. If you do hit it, you will be brought to a bonus screen where you will spin a large wheel that has spaces where you can win one of four different Progressive Jackpots. The biggest is the Mega jackpot that starts at 1,000,000, then the Major jackpot that starts at 10,000, then the Minor jackpot that starts at 100, and the Mini jackpot that starts at 10. You put all these features into one game and you have one amazing video slot game!